Little Busters! 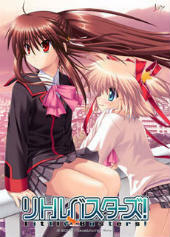 is a romance visual novel in which the player assumes the role of Riki Naoe. The main part of the story takes place at a high school in Japan. There is a "secret of this world" that Kyousuke speaks of; Kengo and Masato are also aware of this. The characters live in either the male or female dormitories on the school grounds which are across to each other. Beside the dorms is the main school building where classes take place, which also houses the cafeteria on the ground floor. The school is four stories and the roof is normally restricted from access. Beyond the main school building is the large schoolyard, with the pool area adjacent to the yard. On the other side of the field is the baseball field, with the gymnasium and tennis court beyond it, which are closer to the main school building.Much of its gameplay is spent on reading the story's narrative and dialogue. The text in the game is accompanied by character sprites, which represent who Riki is talking to, over background art. Throughout the game, the player encounters CG artwork at certain points in the story, which take the place of the background art and character sprites. When the game is completed at least once, a gallery of the viewed CGs and played background music becomes available on the game's title screen. Little Busters! follows a branching plot line with multiple endings, and depending on the decisions that the player makes during the game, the plot will progress in a specific direction. In 2017, an English Edition was released.